Comments: A facsimile was produced by Gordon Winrod of Gainesville, MO in 1987. It is reduced in size by 10%. Also, the text (minus the notes) was reprinted in the English Hexapla (1841) and the New Testament Octapla (1962). 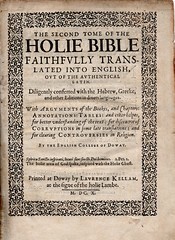 The text and notes were also included in a parallel edition with the Bishops' Bible prepared by William Fulke in 1589. Recent Sales: A copy of this edition sold for $4,182 (including buyer's premium) at a Heritage Auction sale on October 16, 2008 (Ebay No. 260295192864). 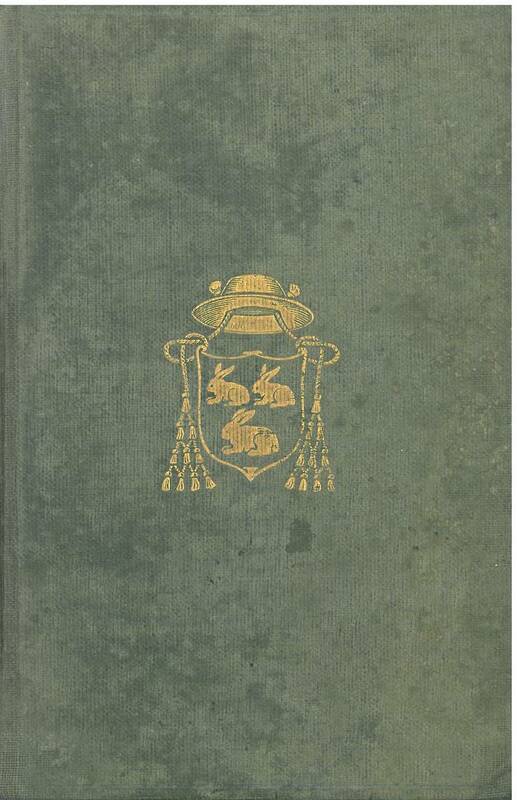 A copy sold for $13,750 (including buyer's premium) at a Swann Galleries auction sale on October 27, 2015 (Ebay No. 201439220656). A complete Bible, including the 1609-10 Old Testament sold for $20,000 at Christies sale No. 3900 on December 15, 2015 (lot No. 147). 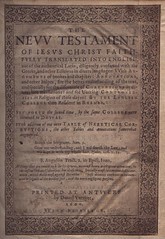 A complete Bible including the 1609-10 Old Testament sold for $22,500 including auctioneer's premium at Sotheby's sale No. 9539 on December 5, 2016 (lot No. 82). A complete Bible including the 1609-10 Old Testament sold for $30,030 (22,500 pounds Sterling including auctioneer's premium) at a Christie's auction on December 13, 2017. 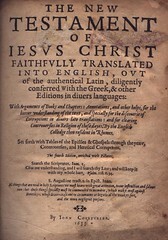 Title The / Nevv Testament / of Iesus Christ Faith- / fvlly Translated into English, / out of the authentical Latin, diligently conferred with the / Greeke, and other Editions in diuerse languages: With Ar- / gvments of bookes and chapters: Annotations, / and other helpes, for the better vnderstanding of the text, / and specially for the discouerie of Corruptions in di- / uers late translations: and for cleering Controver- / sies in Religion of these dayes: By the English / College then Resident in Rhemes. / Set Forth the second time, by the same College novv / returned to Doway. / VVith addition of one nevv Table of Heretical Cor- / rvptions, the other Tables and Annotations somevvhat / augmented. / Printed at Antwerp / by Daniel Vervliet / 1600 / VVith Privilege. Contents Text of the New Testament in the original Rhemes (Rheims) Version of 1582 with annotations. Comments A close reprint of the first edition of 1582. It adds a table of "certaine places of the Nevv Testament corrvptly translated in favovr of heresies of these dayes" in previous Protestant translations. Recent Sale A copy of this edition sold at a Swann Gallery Auction on March 7, 2008 for $2,640 (including auctioneer premium). Ebay No. 130207828471. 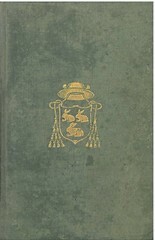 A copy sold for $3,355 (including auctioneer's premium) at a Bonham's auction sale on October 4, 2010 (Lot 1004). A copy sold for $3,000 (including buyer's premium) at a Swann Galleries auction sale on October 27, 2015 (Ebay No. 201439220596). Title The Nevv / Testament / of / Iesus Christ, / Faithfvlly Trans- / lated into English, ovt of / the authentical Latin, diligently conferred vvith / the Greeke, and other Editions in di- / uers languages. / vvith / Annotations, / and other helpes, / for the better vnderstanding of the text, / and specially for the diccouerie of / Corrvptions in diuers late tran- / slations: & for cleering Con- / troversies in Religion / of these dayes. / In the English College of Rhemes. / Printed at Antwerp. / By Iames Seldenslach. / 1621. Contents A reprint of the 1582 first edition in small 12mo. with annotations all printed in a separate section at the end of the book rather than at the end of each chapter. References HERBERT 382, POPE 668-6, COTTON 223, CHAMBERLIN 9. Comments The third edition of the Rhemes New Testament and the first in "pocket size." It was reissued with a new title page by the same publisher in 1630. Provenance The copy shown was sold to the present owner at the Bloomsbury Auction sale of March 10, 1998 and is signed on the title page by Father Cuthbert Haydock (1684-1763) a Catholic Recusant priest who said Masses in a secret chapel hidden in Lane End House in Mawdesley, Lancashire, England. This house is still in existence. Reported Sales A copy of this edition sold for $4,000 (including auctioneer's premium) at the Ryrie Sale by Sotheby's on December 5, 2016. 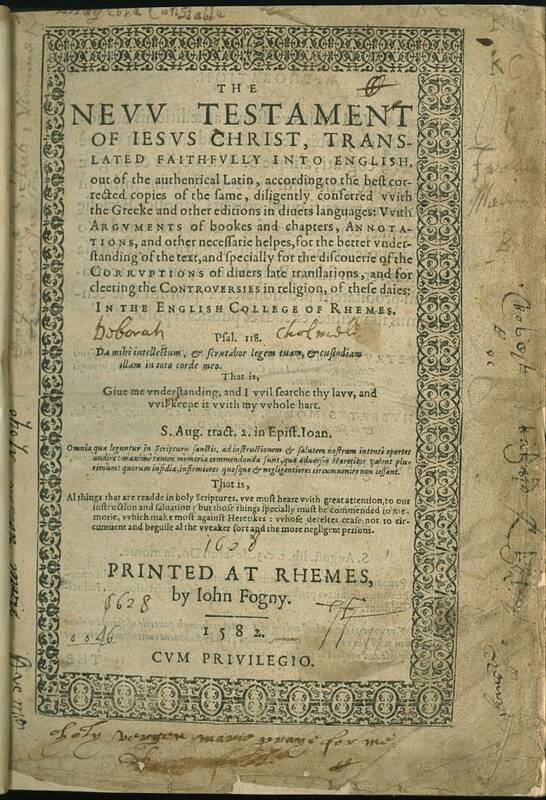 Note In 1623, an attempt was made by English Catholic Recusant printer Peter Smith to print an edition of the Rhemes New Testament at a secret press in the Bunhill area of London. However, his premises were raided and his press and type battered and defaced. Title The New / Testament / of / Iesus Christ, / Faithfully translated into / English, out of the authentical La- / tin, diligently conferred with the / Greke, and other Editions in- / diuers languages. / In the English college of Rhemes. / Printed at Antwerp. / By Iames Seldenslach. 1630. Contents A reissue of the 1621 edition with a new and abbreviated title page. References HERBERT 382 (note), POPE 668-7 COTTON 223, CHAMBERLIN 9. Comments This is the copy referred to by POPE (p. 271) as the only copy he had ever seen. At the time he wrote his book (ca. 1946), it was at the Benedictine Abbey at Fort Augustus, Scotland. It was subsequently acquired by the National Library of Scotland, which has given permission for its publication on this site. Title The New / Testament / of / Iesus Christ / Faithfvlly Translated / into English, Ovt / of the authentical Latin, diligently / conferred with the Greek, & other / Editions in diuers languages: / With Arguments of Books and Chapters: Annotations, and other helps, for the / better vnderstanding of the text, and specially for the discouerie of / Corruptions in diuers late translations: and for cleering / Controuersies in Reigion of these dayes. By the English / Colledge then resident in Rhemes. / Set forth with Tables of the Epistles & Ghospels through the yeare, / Controuersies, and Heretical Corruptions, / The fourth Edition, enriched with Pictures. / By Iohn Covstvrier. / 1633. Contents A close reprint of the 1582 first edition of the Rhemes (Rheims) New Testament with the addition of fine copperplate engravings. References HERBERT 479, POPE 668-7, COTTON 223 (note), CHAMBERLIN 9. Recent Sales An imperfect copy lacking the frontispiece and three of the plates sold on Ebay September 25, 2015 for $1,350. A complete copy sold for $1,250 at Sotheby's Sale No. 9539 on December 5, 2016 (lot No. 101). 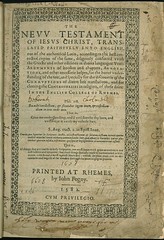 Facsimile: A pdf facsimile of the 1633 edition is available at archive.org. 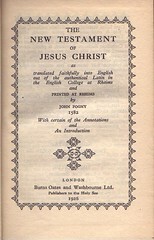 Title: The / New Testament /of / Jesus Christ; / with / Arguments / of / Books and Chapters: / with / Annotations, / And other Helps, / For the better understanding the Text, and especially for / the Discovery of Corruptions in divers late Translations: and / for clearing up Religious Controver- / sies of the present Times. / To which are added / Tables of the Epistles and Gospels, / Controversies, and Heretical Corruptions. / The Text is faithfully translated into English, out of the Authentical Latin, / diligently conferred with the Greek, and other Editions in divers Languages: / and the Annotations &c. are affix'd to it. / By the English College then resident in Rhemes. / The Fifth Edition, (the First in Folio) adorn'd with Cuts. / Permissu Superiorum / Printed in the Year M DCC XXXVIII. Contents: Text of New Testament with revisions by Richard Challoner (1691 - 1781) and Francis Blyth (d. 1772) with annotations. Comments: This is a revision of the Rhemes New Testament text. 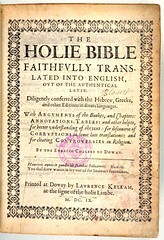 Although Challoner was involved, the revision is far less extensive than in the his later series of New Testaments that began to appear in 1749, so it is usually considered in a separate category. Title The / New Testament / of / Jesus Christ; / with / Arguments / of / Books and Chapters; / Annotations, / And other Helps, / For the better understanding the Text, and especially for the Discovery of / Corruptions in divers Translations: / And for clearing up Religious Controversies of those Times. / To which are added, / Tables of Controversies, and the Epistles and Gospels. / The Text is faithfully translated into English, out of the Authentical Latin, diligently conferred / with the Greek, and other Editions in divers Languages: and the Annotations, &c. are affix'd / to it. / By the English College then resident in Rhemes . / The Sixth Edition (the second in Folio) adorn'd with Cuts. / Permissu Superiorum / Liverpool: Printed in the Year MDCCXXXVIII / And Sold by R. Ferguson, Bookseller in Dale Street. Contents Text of New Testament with revisions by Richard Challoner (1691 - 1781) and Francis Blyth (d. 1772) with annotations. Comments A new edition of the folio Rhemes New Testament of 1738 with some revisions, produced in substantially poorer quality with inferior execution of the engraved illustrations and inferior quality paper. Title The / New Testament / of / Jesus Christ; / with / Arguments / of / Books and Chapters; / Annotations, / And other Helps, / For the better understanding the Text, and especially for the Discovery of / Corruptions in divers Translations: / And for clearing up Religious Controversies of these Times. / To which are added, / Tables of the Epistles and Gospels. / The Text is faithfully translated into English, out of the Authentical Latin, diligently conferred with / the Greek, and other Editions in divers Languages: And the Annotations, &c. are affixed to it. / By the English College resident in Rhemes in 1582. / The Sixth Edition (the Second in Folio) adorned with Cuts. / Liverpool: / Printed and Sold by P. Wogan, No. 23, on the Old Bridge. / MDCCLXXXIX. 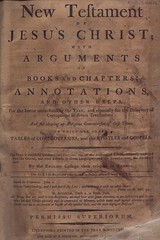 Comments A reissue of the 1788 edition (supra) with a new title page. 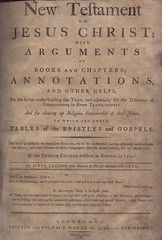 Facsimile: A pdf facsimile of this edition is available at [https://archive.org/details/Challoner-blythNewTestament1789]. 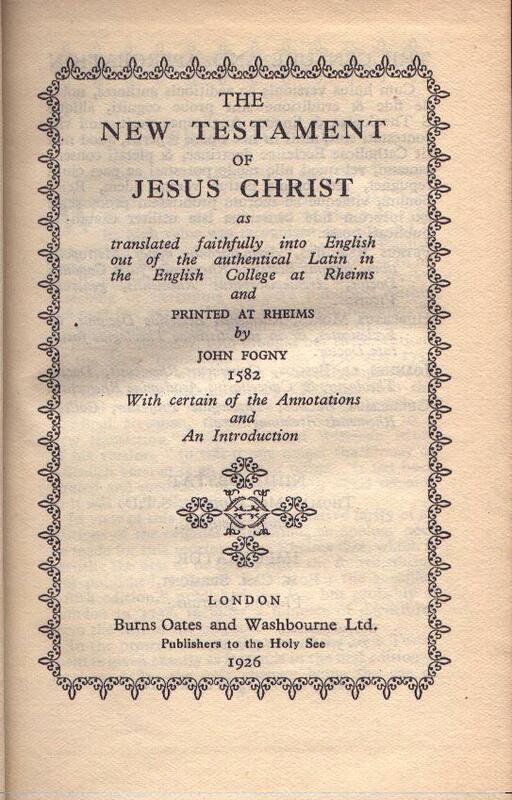 Title The / New Testament / of / Jesus Christ / as / translated faithfully into English / out of the authentical Latin in / the English College at Rheims / and / Printed at Rheims / by / John Fogny / 1582 / With certain of the Annotations / and / an Introduction / London / Burns Oates and Washbourne Ltd. / Publishers to the Holy See / 1926. Contents The New Testament of 1582 with modernized orthography edited by G. Roger Huddleston, O.S.B., with his introduction. Comments A handy edition of the original Rheims text with modern spelling and in small pocket size. It includes sample annotations from the original edition. Description: Quarto. 2 vols. 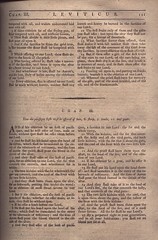 (v.1: , 1115 pages, 8½ × 6 inches; v.2: 1124 [i.e., 1128] pages, 8 × 6¼ inches). Title within ornamental border. The arrangement of the text on the page follows the same layout as the New Testament (1582). Bound in brown calfskin. Comments: The text (minus the notes) of Genesis was reprinted in the Genesis Octapla (1965). Recent Sales A copy of this edition sold for $3,000 (including auction premium) on June 26, 2008 at PBA Galleries (Sale # 382; Lot # 19). An imperfect copy consisting of mismatched volumes sold for $4,500 (including buyer's premium) at a Swann Galleries auction sale on October 27, 2015 (Ebay No.201439220574). 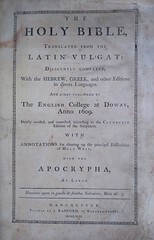 A copy inscribed by John Knatchbull, Vice President of Douay College, sold for $25,000 (including buyer's premium) at a Sotheby's auction sale on December 2, 2015 (Pirie Sale, Lot 73). 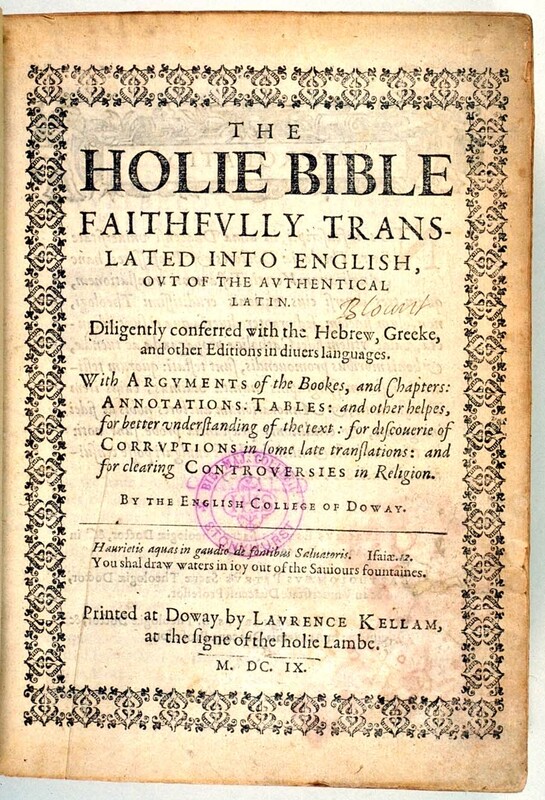 Title The / Holy Bible / Faithfvlly Translated / Into English Ovt Of / the authentical Latin, diligently / conferred with the Hebrew, / Greek, & other Editions in / diuers languages: / With Arguments of the Bookes and Chapters, Annotations, / Tables, & other helps, for better vnderstanding of the text: / for discouerie of Corruptions in some late translations: and for clearing Controuersies in Religion. / By the English Colledge of Doway. / Printed by Iohn Covstvrier. / Permissu Superiorem. / M. D. XXXV. Contents The Old Testament text in the original Douay Version. Comments Published in two volumes as was the first edition. It forms a complete three-volume Bible with the 1633 New Testament (supra). This was the last time the Douay Rheims Old Testament was published until 1750 (115 yrs. later) when Dr. Challoner published his revised edition. A facsimile was produced in 1987 by Gordon Winrod of Gainesville, MO. It is reduced in size by 10%. 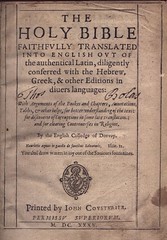 Title The / Holy Bible, / Translated from the / Latin Vulgat: / Diligently Compared, / With the Hebrew, Greek, and other Editions / in divers Languages. / And First Published by / The English College at Doway, / Anno 1609. / Newly revised, and corrected, according to the Clementin / Edition of the Scriptures. / With / Annotations for clearing up the principal Difficulties / of Holy Writ, / With The / Apocrypha, / At Large. / Manchester: / Printed byJ. Radford, in Hanover-Street, / M,DCC,XCIII. Contents The text of the original Douay Old Testament with modernized orthorgraphy. References HERBERT 1375, Taliaferro-EELBV 7212.